A local destination offers a digital detox and a million-dollar view — all in 160 square feet. See photos. WASHINGTON — Jon Staff wants your next vacation to be boring — really boring. That’s an unusual sentiment coming from the founder of a growing vacation rental company, but then again, Getaway doesn’t cater to the typical escape. Its goal is to get guests to unplug. 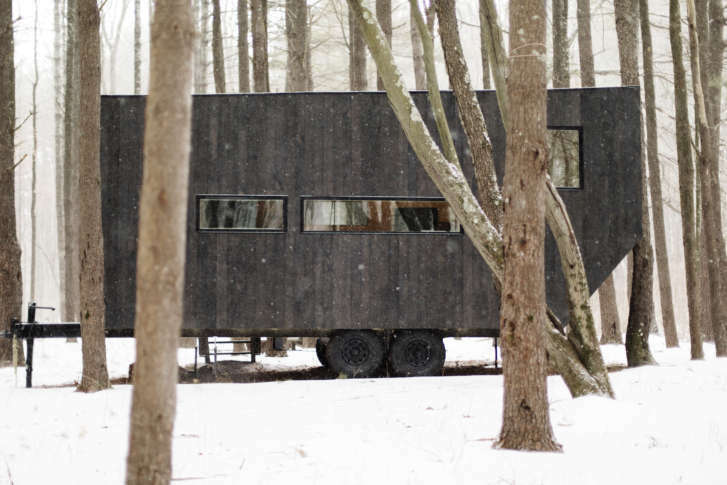 About three years ago, Staff and co-founder Pete Davis, both Harvard graduates, established a refuge for stressed-out city dwellers with a collection of tiny houses on a plot of land in the woods, just a short drive from Boston and one near New York. Recently, they expanded Getaway to the D.C. area, near Shenandoah National Park. The modern-design, 160-square-foot homes come equipped with a shower, a queen bed, a small kitchenette, an outdoor fire pit and plenty of light from large windows. Just don’t expect spare chargers and docking stations: Wi-Fi is not available and digital devices are discouraged. “When you check into a Getaway, the first thing you’re prompted to do is put your cellphone in the cellphone lock box,” Staff said. Unlike other vacation destinations, Getaway does not provide guests with the exact location of their reserved cabin until shortly before the stay. Staff said this is to help guests disconnect before the vacation even starts. “We actually want to prevent you from doing what we all do, which is planning out our time minute by minute,” Staff said. If you’re really desperate for an activity, Staff said the cabins have maps of constellations for star gazing, as well as a deck of cards that prompt deeper discussions with your travel companion. There’s even a basket of provisions available for purchase — coffee, pasta, s’mores, etc. — so you don’t have to think about food to pack. Each of the three Getaway locations has between 20 and 40 cabins scattered throughout about 80 acres of woods. And while Staff said “the goal of Getaway is to get you away from everything, including other humans,” a company representative is nearby, should anything go wrong. “Quit planning your time off minute by minute and see if you can feel what it’s like to be bored again, or just let your mind wander, because we seem to have lost that little bit of our humanity in the digital age,” Staff said.